As rescuers, we’re in the business of finding homes for the homeless, so when those matches have finally been made, the last thing we want is to compromise on safety. We also believe that it’s our job to educate new owners on ways to keep their newly adopted companion safe. If a lost dog turns into a homeless dog, we start all over again – which is an outcome we never want. So we are thrilled to be part of Lost Pet Prevention Month with PetHub and share what we’ve learned about pet safety. Keep in mind that your rescue dog might be a flight risk. We don’t always know the past of animals in rescue. For this reason, often times they are very fearful of their new environment and are a flight risk until they become familiar with their new home. This might take a few weeks or longer. Patience and vigilance is key. Physical fence safety – check your fence for areas that could be escape routes. o Fence jumpers: Sometimes the rescue organization will know if they have a fence jumper, however, until you are certain your new friend cannot escape, we recommend supervising your adopted dog while outside. o Diggers: Make sure the base of the periphery is secured. Sometimes a simple rock or boulder can block an area that a digger can get through. o Woodpiles or other items situated up against the fence: These objects are easy to jump up on and get over a fence. Relocate anything that could be leverage for a dog to climb. Dogs can easily slip their collars and people are reluctant to attach a collar too tight. We recommend the use of a harness or training collar. 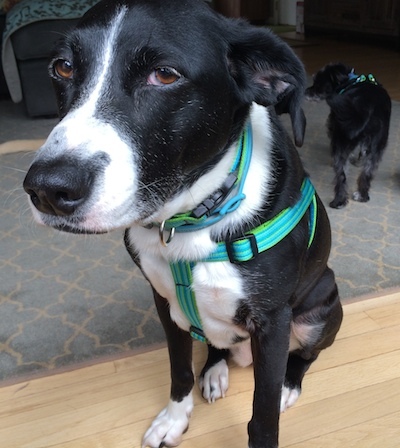 Even using both together for particularly skittish or strong dogs will prevent them from backing out and will ultimately make walks more enjoyable. We recommend that each dog being transported is wearing collar and is crated if possible. If a crate isn’t available, tethering their leash to a part of the interior ensures that their movement is restricted. Make sure to take extra precaution when opening the car door, as they may want to bolt. For this reason, it’s strongly encouraged to leash the dog prior to opening any car doors. o Make sure you spend quality time introducing your new dog to the neighborhood. Walk them around so they get to know the area. Make sure your neighbors meet your dog, so if there is an escape, they know whom to look for. 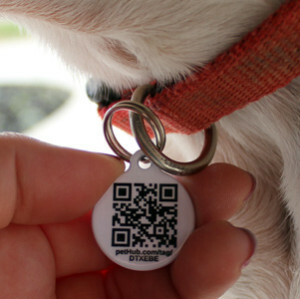 o ALWAYS make sure your dog has proper identification. While microchipping is great for rescue organizations to assist in recovering lost pets for owners, a visible tag is the fastest way to reunite a lost dog with his/her owner. So often, people find pets at odd hours and can’t get them scanned until they can get to a vet clinic. Having a tag on your pet reduces the time it takes to get your lost dog back home, as well as alleviates the anxiety caused by your dog going missing. Spread the word about these simple steps for safety and continued vigilance, and together we can all play a part in keeping our cherished pets at home where they belong!